IEC 60695-2-13:2010+A1:2014 specifies the details of the glow-wire test to be applied to test specimens of solid electrical insulating materials or other solid materials for ignitability testing to determine the glow-wire ignition temperature (GWIT). 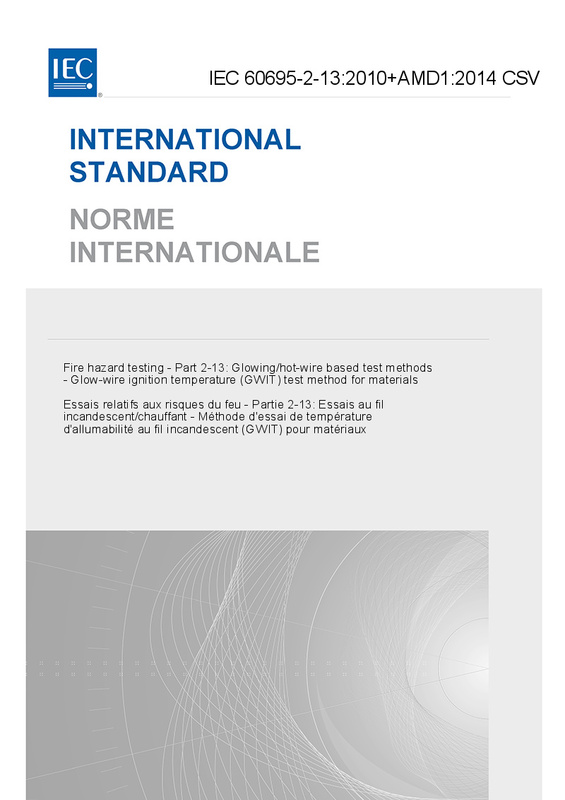 The GWIT is the temperature which is 25 K (or 30 K) higher than the maximum test temperature, determined during this standardized procedure, at which the tested material does not ignite, or if sustained and continuous flaming combustion does not occur for a time longer than 5 s for any single flame event and the specimen is not totally consumed. This second edition of IEC 60695-2-13 cancels and replaces the first edition published in 2000. It also constitutes a technical revision. The main changes with respect to the previous edition are: - modified title; - addition of an Introduction; - clarification of Scope; - expansion of Clause 2: Normative references; - expansion of Clause 3; - revision of Clause 4 to alignment with the IEC 60695-11 series to introduce guidance on test programs for material variations; - clarification of Clause 8: Conditioning (now Clause 7); - deletion of Clause 9: Initial measurement; - expansion of Clause 10: Test procedures (now Clause 8); - expansion of Clause 11: Observation and measurement (now Clause 9); - clarification of Clause 12: Evaluation of test results (now Clause 10); - expansion of Clause 13: Test report (now Clause 11). It has the status of a horizontal standard in accordance with IEC Guide 104 and ISO/IEC Guide 51. This publication is to be read in conjunction with IEC 60695-2-10:2000. This consolidated version consists of the second edition (2010) and its amendment 1 (2014). Therefore, no need to order amendment in addition to this publication.